I have never before enjoyed such a cornucopia of drinks on holiday. Phuket is definitely beverage heaven. That first morning, straight off the plane from London (via Bangkok), we limped down a hot, hectic street into The Outdoor Restaurant (that’s what it’s actually called) and I spotted a sign saying: watermelon shake 50 baht. Too hot for coffee (I like cold beverages when it’s 30 degrees outside), I ordered my first of many, many shakes. A tall glass of what was basically liquid watermelon was placed in front of me and I was sold. 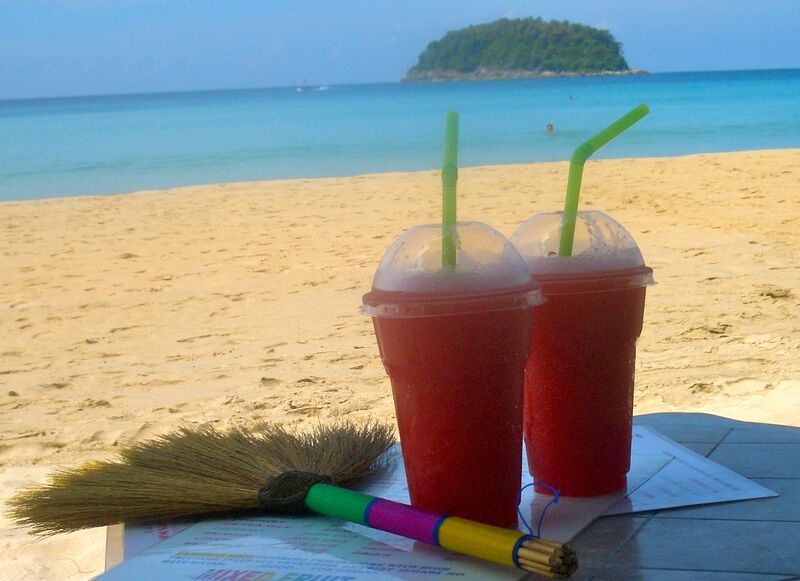 Shakes in Phuket are made from loads of fresh fruit, a dash of sugar syrup and plenty of ice, all blended together. So simple. To give you an idea of their fruitiness, the tomato one had four large plum tomatoes in it. The chef/patron, general all-round hard worker at our little restaurant on the beach, The Cartoon Shop (more of that later) was the king of the shake. Every morning I made it my mission to try a different one and just about got through the list. 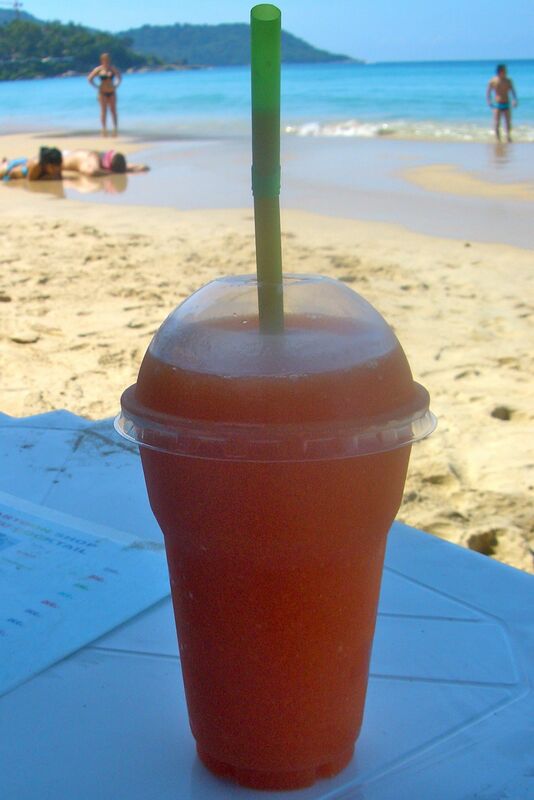 My favourite two were papaya and watermelon…but they were all amazing. Before I even had my first shake of the day, there was the juice at breakfast to look forward to. Each morning something different presented itself. First it was butterfly pea juice – and it was blue! Made from the flower of the butterfly pea plant it’s packed with antioxidants – a little bit sweet for me but I polished it off for the sake of my health. 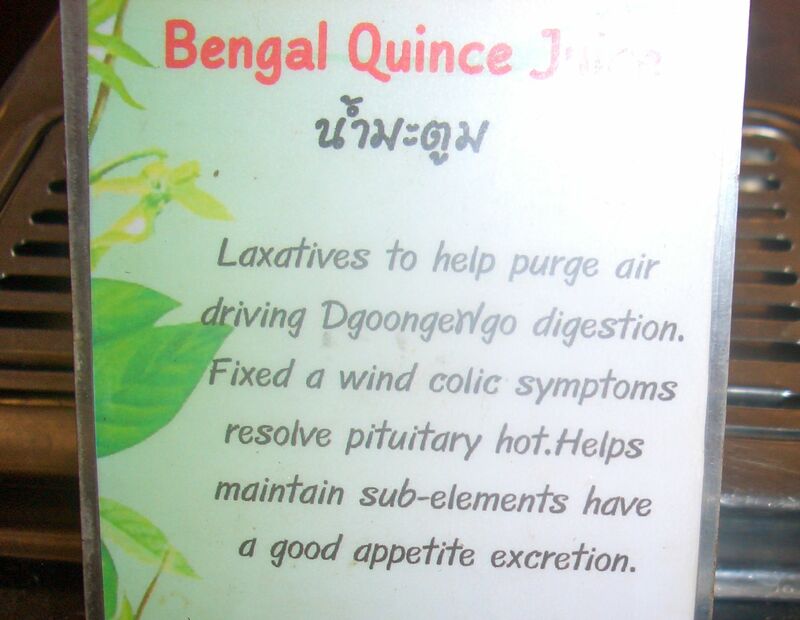 We also sipped on chrysanthemum juice, rosella juice and Bengal quince juice to get going in the mornings. Bengal quince came with a sign which says it all, really. 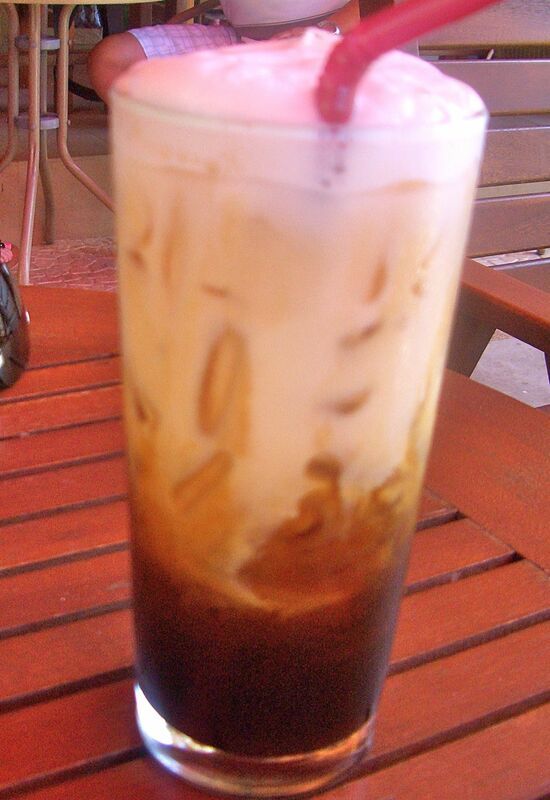 You’ll also find some seriously good coffee in Kata Beach. We love our coffee fix so sought a good coffee shop out and soon had a favourite. As well as serving the coffees you’d expect, their menu was a joy to pore over. My favourite was the iced latte, exactly what it said it was, no cream or anything else added, just chilled latte – heaven. Terry swore by the cappuccinos (he can do hot beverages in hot weather) and one day I even tasted a lemongrass water – really refreshing and no doubt health-giving again. Now on to alcoholic drinks. 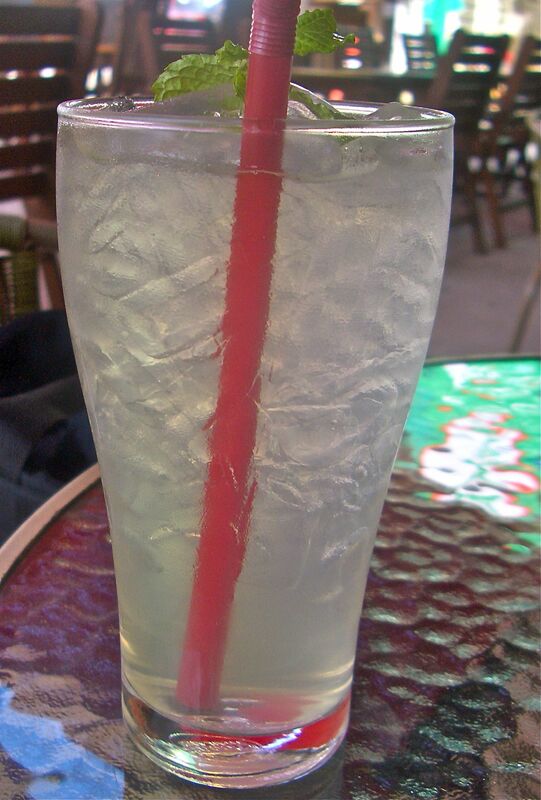 No holiday is complete without a gin and tonic before dinner. Our favourite from Re Kata a stunning beach club where we also had dinner one night (blog coming soon). 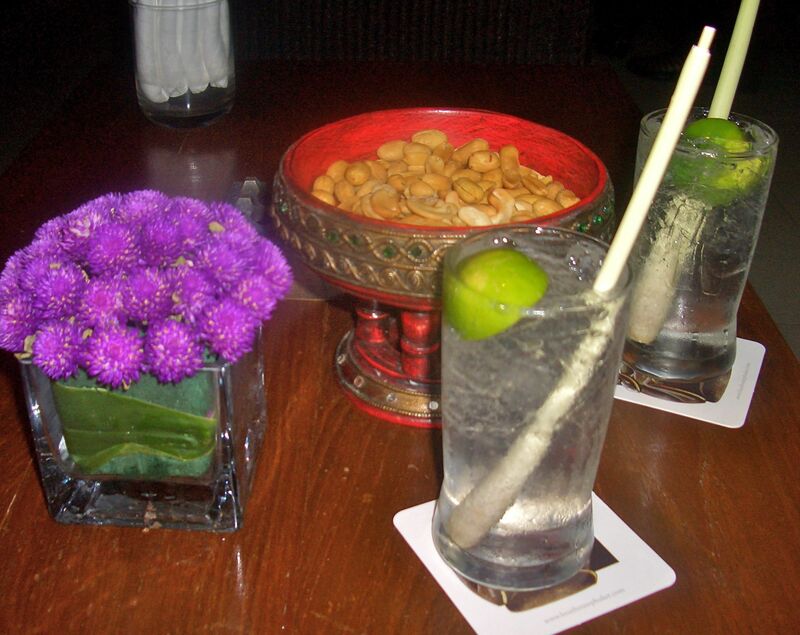 Loved the lemongrass stick, this is g&t Thai style. Hot weather, sandy feet and mouthfuls of saltwater while swimming in the delightfully warm and clear Andaman Sea brings on the need for a cold beer. 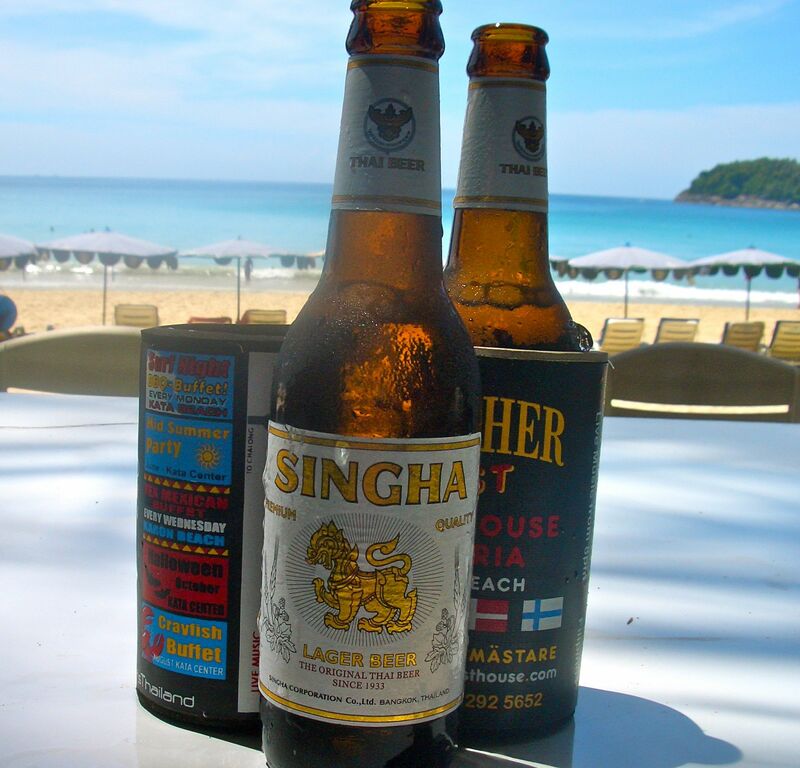 Thailand’s famous Singha beer is wonderfully refreshing and served properly chilled to bring your temperature down immediately. And then of course there’s a myriad of cocktails. On the down side wine is expensive, expect to pay at least £20 for a bottle of red in a restaurant. We tended to drink Chillean or Argentinian at that sort of price and they were perfectly acceptable. What am I going to drink now I’m back in London? One thing’s for sure, my daily beverage choices aren’t going to be the same. Thank you Thailand for the best drinks ever.